In 1923, passionate South Adelaide supporter Charlie Knuckey donated a silver cup to be awarded annually to the best and fairest player in the league team. The first award was made to Dan Moriarty who had previously won three consecutive Magarey Medals, still the only SANFL player who has achieved this. Many champions since have had their names etched into South Adelaide's highest individual honour, including the likes of Frank Tully, Jim Deane, Peter Darley, Mark Naley, David Kappler, Nick Liddle and Joel Cross. Darley won the Cup seven times, the most of any player, with Deane not far behind him with six. The Knuckey Cup is the oldest award of its type in the SANFL, having now has been presented for over 90 years, but what of the man behind it? Charles Kingscote Knuckey was born in 1888, the fourth of five children to John and Louisa Knuckey, of Kensington Gardens. He died in in the North Eastern Community Hospital, Campbelltown in 1988, just two weeks short of his 100th birthday. Nora, his wife of 70 years died two weeks later. Charlie's father died when Charlie was an infant and his mother struggled bringing up the family. They moved to West Terrace where she took in boarders. As a youngster Charlie watched the West Adelaide Football Club train on the parklands opposite his home, but after being taken to a game between South and Norwood, the dominant teams of the early SA competition, he became a passionate South Adelaide supporter. South had won seven premierships between 1866 and 1900. Charlie played in South's junior grades but was small and slight and never made the senior team. However he was friendly with many of the players and often carried their boots when they played in the South Parklands. He developed a lifelong interest with the Panthers and sport in general. In 1908 he took a job as a commercial traveller with the SA Paper Bag Co. but this budding career was interrupted by the outbreak of the Great War. Charlie enlisted in 1914 and served in the medical corps in Egypt, Gallipoli, France and England. 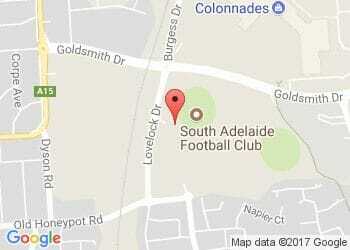 Returning home in 1918 he renewed his association with South Adelaide. In 1919 he married Nora Drury whom he had met in England and they had two sons, Kim and Richard and a daughter Naida. Charlie had an early interest in motoring and established the Knuckey Rubber and Tyre Co. in Grenfell St, specialising in tyre sales and repairs. He was one of the very early SA drivers with a licence number comprising only three figures. Charlie worked as a commercial traveller (travelling salesman) for most of his working life regularly driving as far afield as Eyre Peninsula and Broken Hill. He enjoyed driving and his many cars, and bought his last new car at the grand old age of 93. He also kept an aviary where he bred finches, and played kettledrum in the Caledonian Society pipe band. He had a strong affinity with Kangaroo Island where his mother was born she had given him the second name Kingscote. Over his lifetime Charlie occupied almost every position on South Adelaide committees. He witnessed the 1935, 1938 and 1964 premierships and shared his passion for South Adelaide with his family. After the 1964 Grand Final, Charlie's son Kim bought a keg of beer for his neighbours in Felixstowe, mostly Norwood supporters with some winnings wagered on the match. During his time at South he tried particularly to protect South's recruiting zones, which had suffered in the electorate system introduced at the turn of the 20th century, and again in the 1970's redistribution. Charlie personally presented the Knuckey Cup until his death, only absence or illness could prevent him from doing so. His grandson Brett Knuckey, a volunteer remedial massage therapist at the Club, has continued this tradition since Charlie's death. Charlie Knuckey was the sort of person that football clubs depend and thrive on. He devoted much of his private time to South Adelaide over his long life and is fittingly remembered in the award which he inaugurated and bears his name.